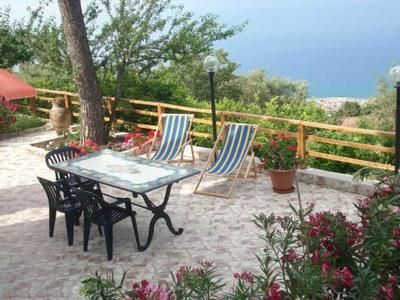 The house is situated in a dominant position with a terrace from which you can admire a wonderful sea panorama starting from the Gulf of Patti over Cape Milazzo and ending with the Eolian Islands. It is surrounded by olive-, almond-, lemon trees and furthermore by the typical Mediterranean spot. Perfect for healthy family holidays it lies close to the clean Tyrrenian Sea and far away from city stress. Sand beach abt 2,5 km, restaurant abt 0,6 km, next food shop abt 3 km, more shops, bank and restaurants at Patti Marina abt 4 km, tennis ground abt 2 km, hospital abt 6 km, gasoline station abt 4 km, Patti abt 6 km, Gioiosa Marea abt 9 km, Tindari abt 15 km, Milazzo (port for Eolian Islands), Messina abt 70 km, Taormina abt 110 km, Cefalù abt 100 km, Mount Etna abt 140 km, Syracuse abt 210 km, Agrigento abt 230 km. Cot for children: per person and week for rent at a price of 20 EUR (optional). Towels: per person and week for rent at a price of 7 EUR (optional). Il townceter è circa di distanza dalla casa di 3 km. Nella città si possono trovare tutte le più necessario per il vostro viaggio. Il mare e le spiagge sono l'attrazione principale di questo luogo, che è ricca di storia, cultura e gastronomia. Bed linen (per person and week, according to consumption 7 EUR). Cot (per person and week, according to consumption 20 EUR). Pet (per property and day, included in price 0 EUR). Towels (per person and week, according to consumption 7 EUR).